Large open spaces such as gyms, halls and public access areas rarely offer an acoustically balanced environment. High ceilings and hard surfaces can cause reflections and excessive reverberation, conspiring to make speech and music difficult to hear if not totally unintelligible. Our range of Acoustic Panels has been designed to reduce reverberation and to absorb low frequencies, resulting in a cleaner, clearer listening experience. 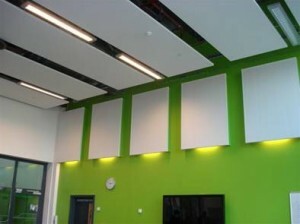 Acoustic panels are available in a wide range of colours and designs, to complement existing décor. They can be made to measure and are equally suitable for new build or refurbishment projects. Please contact AMT Media for more information.